At 29 weeks pregnant with twins, Carole Hobson is — like most expectant first-time mothers — a mixture of ­nervous excitement and apprehension. This, she admits, has been a difficult pregnancy, and it will be a relief when her babies are born, hopefully, healthy and well. Carole has suffered severe morning sickness, painful swelling of her legs and, most recently, dangerously high blood pressure. This week she was hospitalized for five days, and she has been warned by medical staff the twins — not due until February 23 — could arrive any day. She has been injected with steroids to help her babies' lungs mature if they emerge ­prematurely, and she is taking medication to lower her blood pressure in the hope that she can carry them to 34 weeks when doctors plan a Cesarean delivery. The risk to her own health is, however, one she is fully prepared to take in order to realize her dream of having children; a dream that has so far cost her more than £20,000. But that is by no means the most surprising part of the story. 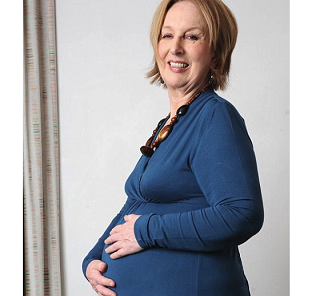 For Carole is 58 years old — an age when most women are well past the menopause. And she is single. Her twins, a boy and a girl, have no genetic link to her whatsoever. They were conceived using donor eggs and sperm. Originally posted on December 11th, 2010.